And when you actually need to do something about them. WARNING LIGHTS ON the instrument cluster are there to tell you information about how your car is performing and if certain systems need attention. Many of the lights illuminate when the engine is turned on and go out after a second or two. But sometimes lights will stay on to indicate an issue. Some of these icons are easy to read and fix, like adding water to the screen wash tank but some are a little more difficult to interpret. Here are some of the most common warning lights and what they actually mean… and we’re also showing you an easy-to-use tool to troubleshoot any warning lights that may be on in your vehicle. There may be an issue with one or more of your car’s airbags. A faulty airbag may not deploy if there is a crash or it may suddenly go off when you least expect it. Best get this checked out by a mechanic. This icon is usually one of the ones that lights up when you first turn your car on. However, if it doesn’t go off, or turns on again while driving, there could be an issue with the car’s electrical system – for example a faulty battery or alternator (the thing that charges the battery). If the alternator isn’t working, then the car’s battery is not being charged and the vehicle will come to a stop at some stage. This is another one you should get looked at ASAP. The warning light could mean the brake fluid level is low, that the brake pads should be replaced or that the anti-lock braking system is faulty. Either way, you need to get this checked out right away. Properly functioning brakes are a must for everyone’s safety on the road. This light could simply mean a sensor failure – but if it accompanies a lack of power in your car, most likely there is a fault with the engine or engine control unit. It is best to get this checked by a trained mechanic as soon as possible before any costly and long-term damage to the engine occurs. 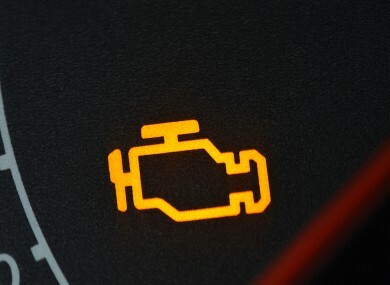 This light could simply mean that the coolant level is low and you need to top it up. However, if this light comes on and you notice the temperature gauge is in the red zone it means the engine is overheating and it needs to cool down. Pull over ASAP and turn off the engine to allow it to cool down. An overheating engine is a sign that there is something wrong, so even if it does cool down it is probably best to get it checked out to make sure it doesn’t happen again. As much as this symbol looks like you are going to be granted three wishes, it simply means that there is an issue with the oil – for example high temperature, low oil level or low pressure. Oil is like the blood flow to the engine – it keeps it running smoothly and prevents damage – so it is vital you check this out. The first step is to check the level yourself and top up if necessary. But if there is the correct amount of oil and this light is still on then you need to get it looked at. This light indicates that there is an issue with the electric power-assisted steering (EPS/EPAS) system. If you notice that the steering becomes heavy, the EPAS may have failed. This is quite noticeable at lower speeds, but at higher speeds you may not feel it until you need to change lanes or turn off – and this can be very dangerous. So if this light comes on, slow down, check the steering and try get to a garage quick. Most modern cars now have this handy feature which detects any abnormalities in tyre pressure – ie a possible puncture. If this light pops up, pull over into a garage and check the tyres for damage. Then check their pressure and inflate them to the correct reading as indicated on the inside of the door or the car’s manual. What can you do if there’s one light that KEEPS turning on without an obvious problem? Do you have a particular light that keeps illuminating in your car? Want to know what is causing it and if you can fix it yourself? Well this gadget, the ScanGauge II, may be the solution. It is a an on-board diagnostics (OBD) tool and it plugs into the diagnostic connection under the dash. It is compatible with all OBDII protocols and with petrol cars from 2001 onwards, diesel cars from 2004 onwards and light commercial vehicles from 2007 onwards. The ScanGauge II checks for Diagnostic Trouble Codes (DTCs) and displays how many there are as well as the codes themselves. It monitors the vehicle’s vital systems and provides real-time information – and it shows both set and pending trouble codes to show you what is going on under the bonnet. It also has five built-in trip computers, which keep track of fuel cost, distance travelled, MPG, fuel used, max coolant temp, max rpm and a whole lot more. Armed with the codes you can then use your car’s manual (or Google) to work out what they mean and what needs to be done. You may feel confident enough to fix the problem yourself, which will save you not only time but money too. It also means that if you do decide to take the car to a mechanic, you have a bit more information about the issue so you can accurately describe the problem. You can also search online for how much it will cost to fix the problem so that you know what to expect to be billed by the garage. You can buy it on Amazon for around €166 including delivery. Email “Those warning lights on your dash? Here's how to understand them...”. Feedback on “Those warning lights on your dash? Here's how to understand them...”.